If he were alive today, would Ernest Hemingway be great at writing Tweets? I like to think that he would. After all, he is attributed with writing the famous 6-word novel: “For sale: baby shoes, never worn” (though his authorship of the story is speculation). My Writing Across Platforms class (syllabus) teaches students to write news releases, for social media, content marketing blogging, and white papers. As stated in my Spring 2015 overview of the course, it is my goal to help my students focus on writing concise, specific, clear, powerful text across their assignments. Enter, the HemingwayApp. This free online tool helps “make your writing bold and clear” (There is a paid desktop version, too). The app is easy to use. The app is great. You can see the improvements to your score based on changes you’ve made, allowing for quick feedback and improvement throughout the writing and editing process. In my writing class, I talk on the first day about the power and importance of each word. I use a blind date or another situation where first impressions count. I have students write the first 2 sentences they’d say in the situation, providing a specific goal they want to achieve – e.g., make a positive first impression to set the tone for the date. This fun exercise gets them thinking about goal-driven writing and what all they need to communicate – overt and subtle – with only a handful of words. We then discuss how this applies to other forms of writing – from news releases to Tweets – where first impressions mean everything and failure to grab attention means failure, every word counts. I have students write 3-4 sentences about where they’d go if they had a car full of gas, but no money. Active Voice – subject performs action. Rewrite/reorganize whenever possible to convey the message with fewer words. Replace adjectives with precise verbs. Specific examples should replace vague or unspecific nouns. Remove NEGATIVE writing – when they say ‘not’ put it into the positive. Students switch their writing with a partner. Their goal is to use the writing tips I provide to remove any unnecessary word and strengthen sentences. We talk about how much they were able to cut from their partner’s writing. (Note: Sometimes they cut too much – which ties to the Hemingway quote below, and can be discussed with the quote). 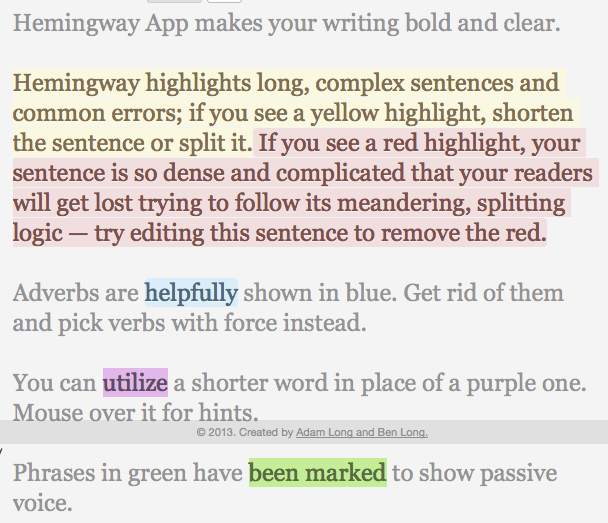 After this, I have students implement the Hemingway App in their writing exercises in class. I provide strict word limits, such as for a news release exercise we did in class last Tuesday. So far, we’ve just started using the app. And already I see students tinkering to strengthen their writing. It is my sense that the app will be a great help as they move along, so long as they commit to using it. I plan to continue to remind them of the goal for concise, clear, powerful writing with new angles or tips during writing exercises throughout the semester. I plan to continue to use the app for my own writing, too. I tell my students that becoming a great writer is a lifelong journey we all must be on. 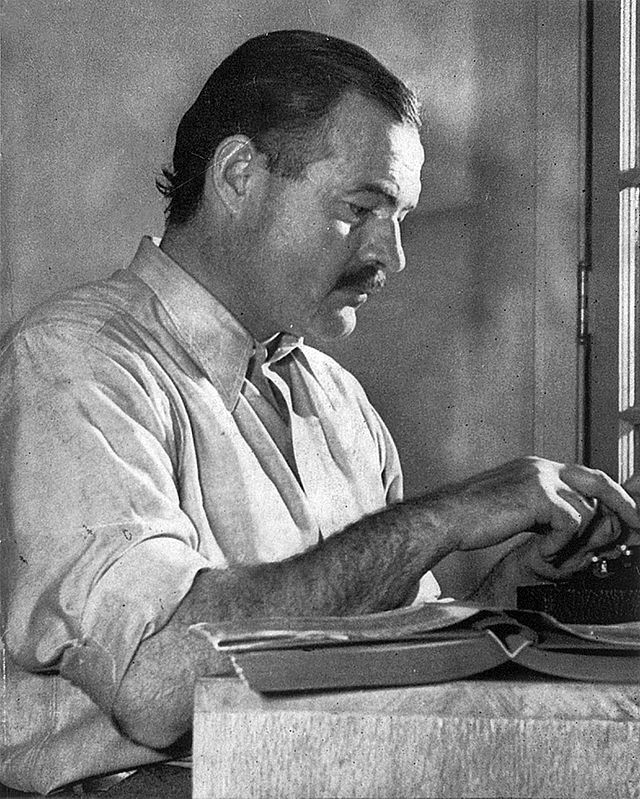 Have you used the Hemingway app to teach writing? How have you found it? What tips do you have? What’s your favorite Hemingway story? I teach Comm 335 Writing Across Platforms (see syllabus), a class that in part looks at writing news releases and other content for the web. 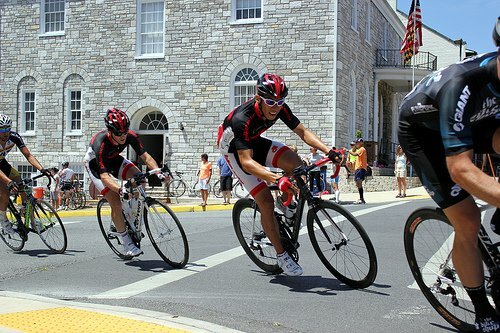 One tactic we talk about is creating Tweetable content for our social media releases assignment. PitchEngine – the social news release website we use for this assignment – enables users to write ‘quick facts’ that readers can Tweet. So when I saw today a similar, more streamlined approach used by the Pew Internet project in their reports, I had to make a quick blog post about it. I was reading the Cell Phones, Social media, and Campaign 2014 report when I stumbled across this. I love this tactic – and wish I had thought of it to teach to my students. 🙂 I may just integrate this into my lecture next semester. I wish I had access to stats from Pew to know how effective these are. Have you seen this before elsewhere? What do you think? Is this effective – do people want to share pre-written Tweetable quotes, or do they want to be able to put it into their own words? This post is long overdue! Several weeks ago, I wrote about the importance of teaching content marketing in the college Communication or Business writing class today. I followed up with a post about Search Engine Optimization and an activity for introducing students to the importance of keyword research using Google Trends. I promised a follow up brief activity with Google Keywords Adwords Tool. Then the end of the semester and life ganged up on me! I realized I needed a full post just to talk about Keyword Competition, using my own website title as an example. Back to the Writing Across Platforms (syllabus) classroom activity I promised! After teaching Google Trends and doing the activity, I plan to teach Keyword Competition and give my students a brief activity to get them practicing keyword competition research for their writing. On the day I first introduce SEO, I assign students to bring to the next class: Brainstorm a list of 5-7 keywords (terms they think people might use when searching for this topic). The topic is: soup. Note: I have also explained on this day what Keyword competition is (for a primer, see my activity on Google Trends and the below slides). I first have students go to the Google Adwords Keywords Tool and we walk through an example on cars (we used cars in talking about Google Trends, so there is consistency). I have students search for “fuel efficiency” and “car safety.” And then have them look at alternative keyword options, competition for each term, and search volume. We discuss. Then I have students take out the 5-7 soup keyword terms I assigned the class before. We write some on the board so students can see the variation of ideas related to soup. This gives students a chance to see how others may search for soup, particularly in ways they didn’t think about. You are going to write a post for your cooking blog. When searching for keywords, think about things that would make for a good blog post subject. Identify and WRITE DOWN 5 terms related to soup with medium to low competition, and high search volume. You’ll need these terms for next class. After students spend 10 minutes or so researching with a partner on an in-class computer, I ask the class “based on your research, what would make for a good blog post subject about soup?” We discuss differences and similarities between what they initially thought up and what their research showed them. I then tell them to bring today’s keyword back next class. Day 3: Writing Keyword Research Headlines (Lecture: 30 minutes; Activity: 15 minutes, + class discussion). To see the lecture on headlines, see the slides below. After, I have students take out their 5 soup keywords that they discovered through research the class before. I give them 10 minutes to write 5 headlines. Each headline must use a different headline formula of those we discussed. Under each headline they are to list: the keyword(s) used, name of formula. Headlines must be less than 60 characters. Pair and Share: Students exchange their headlines with a partner. The partner evaluates the headlines against what we’ve discussed over the past several classes. Partners then exchange notes and discuss. To wrap up, we discuss as a class and address any questions / concerns students may have. And that’s that! I’m excited to see how it goes this fall! Thanks for your patience on this. I hope you are having a great summer! If you enjoy this blog post, please subscribe and share! Please post any comments below! Related lecture slides are below! Day 1: The Set Up: What’s SEO and Keyword Research?